Do you ever wonder who lived in your home before you? Do you wonder what changes they made and why? What were their kids like – did they love sliding down the banister just like mine do? 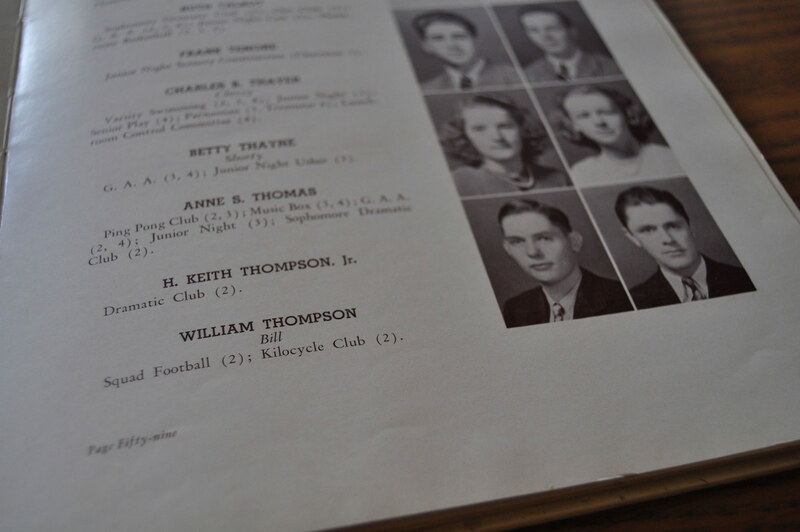 It took more then a few hours of research over several months to compile the history of my home and I learned about the Thompson’s, it’s “First Family”. They had a middle son named George, as do we. That’s kind of nifty. There’s so much information out there, you just have to dig in. If you have older kids, it’s a fun project you can take on together. As it turns out, the author of a semi-obscure scrap book entitled Maplewood in Pictures 1728-1946was assembled right here in No. 139 Maplewood Avenue. Also known as the Thompson Scrapbook or Archives, there are two only copies in existence – one at each of Maplewood’s library branches. 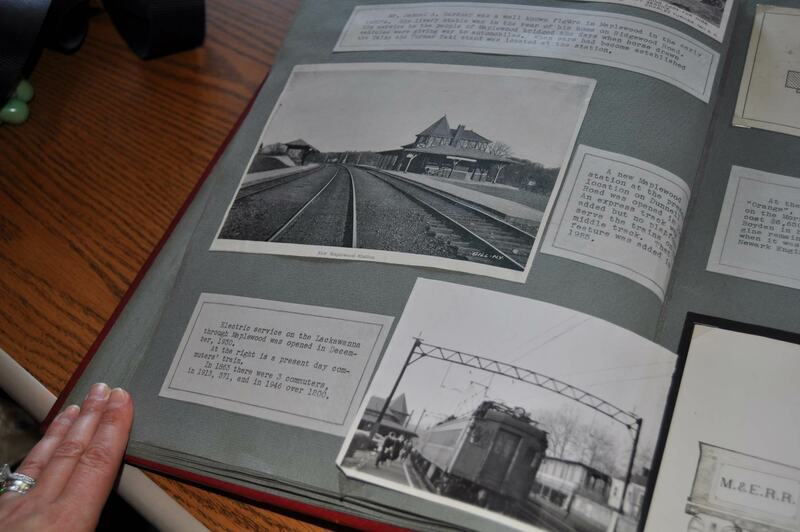 100s of photographs, newspaper clippings, and event brochures were collected by George Knox Thompson over 40 years. Unfortunately, it told little of the history of my home. According to census records, George and his family rented No. 139 in the early days – at least until 1910. The same census shows that they housed a 28-year-old boarder named, Elliot W. Miles. He and George worked together at AT&T. The Oranges and Essex County Atlas Vol. 1, published in 1904, shows that Frederic F. Durand, son of Asher B., owned the property. It stands to reason that the Thompsons rented from Durand. At some point, according to a 1951 interview with Gladys in the Maplewood-South Orange News-Record, Judge Brewer handled the real estate sale. George Sr. was employed at AT&T as a Communications Engineer where he designed and developed telephone equipment, racking up over 40 patents before his retirement in 1929. He was also one of the first members of the American Institute of Electrical Engineers and a lifelong member of the Telephone Pioneers of America. 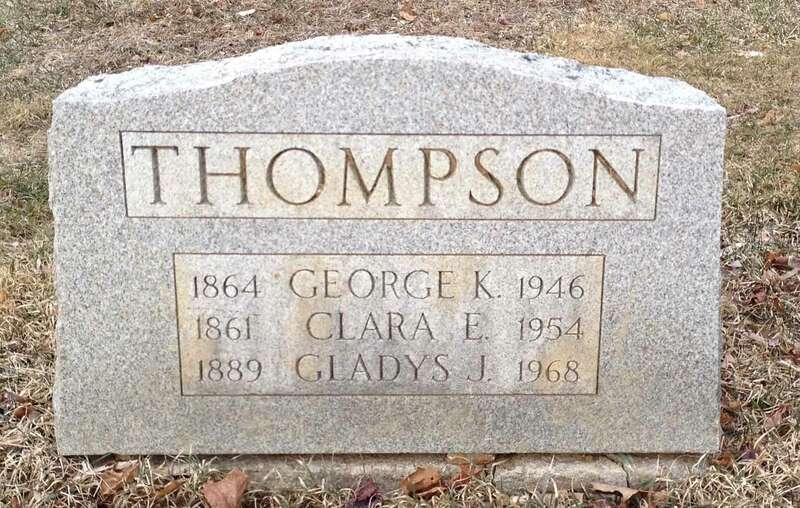 The Thompson’s were one of 40 or 50 families from New England. As a result, the New England Society was formed and thrived for many years right here in Maplewood. 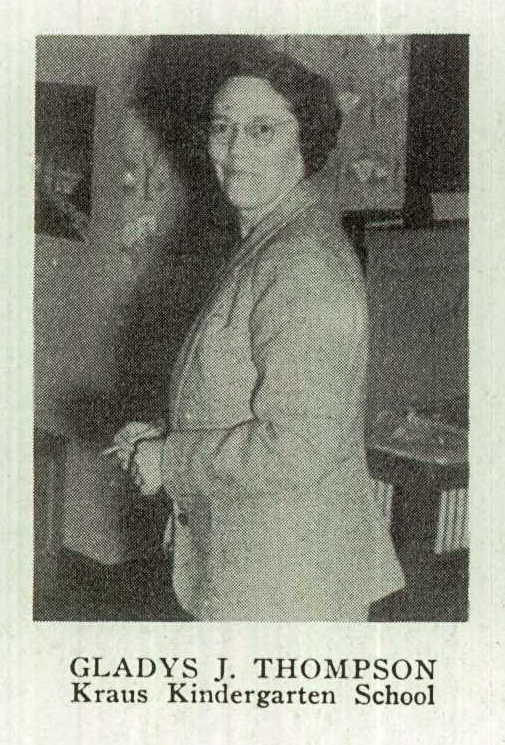 After retirement, and in addition to his beloved scrapbook about Maplewood, George kept himself busy as the curator and later the Acting Director of the New York Museum of Science and Industry between 1928 and 1929. Gladys never married and lived most of her adult-life in No. 139 Maplewood Avenue taking care of her parents. 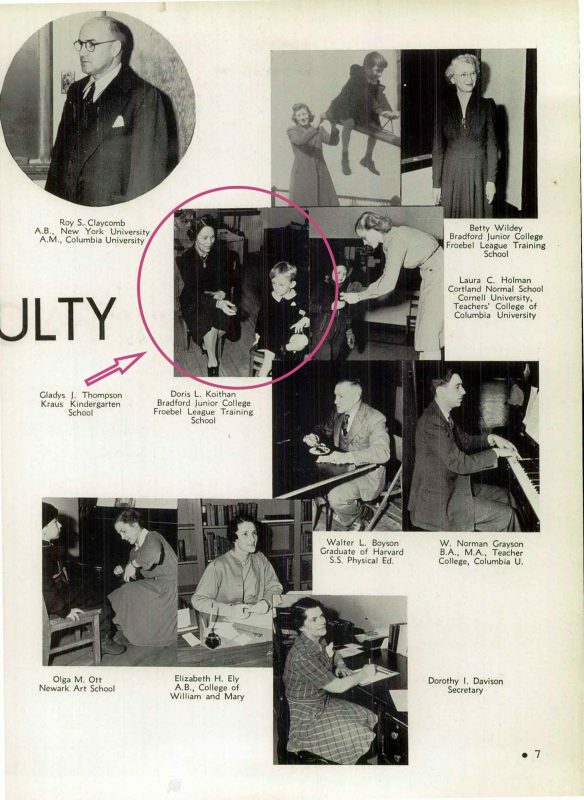 In the 1920’s, she worked as a stenographer, but eventually became a kindergarten teacher at the Carteret Academy in West Orange. According to the New York Times, George passed away at No. 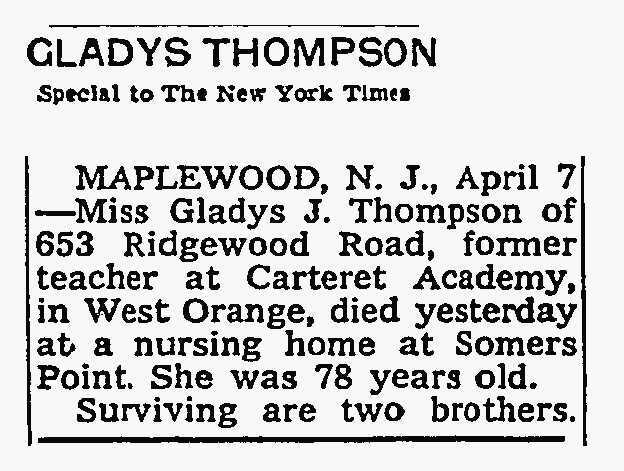 139 Maplewood Avenue on September 22, 1946 at the age of 84. Clara became very ill in 1950 and passed away in 1955 at the age of 94. Her favorite pass time in her later years was reading. Gladys listed the home in 1966 for $32,000 and ended up selling it for $20,000 on June 4th. The taxes were $787.20! After selling No. 139, Gladys moved to 653 Ridgewood Road. I am unsure what her connection is to this home – I know she didn’t own it. Two years later in 1968, she passed away in a nursing home located in Somer Point in Atlantic City, NJ. I heard from a local Villager who either knew her or knew of her that she suffered a fall. 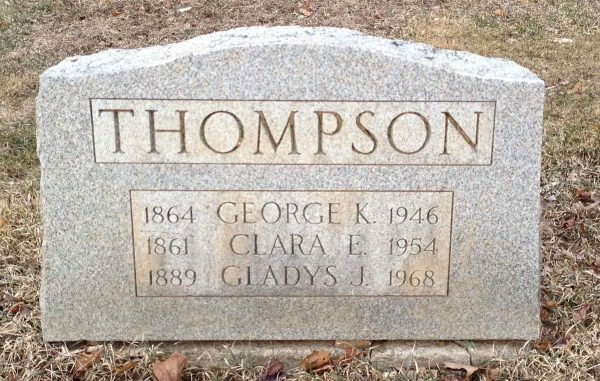 George Knox, Clara Eloise, and Gladys Josephine are all buried in the same plot in the “old section” of Hilltop Cemetery in Mendham, NJ. Their son George Kenneth, also an Electrical Engineer, was drafted for World War I in the years 1917 and 1918. 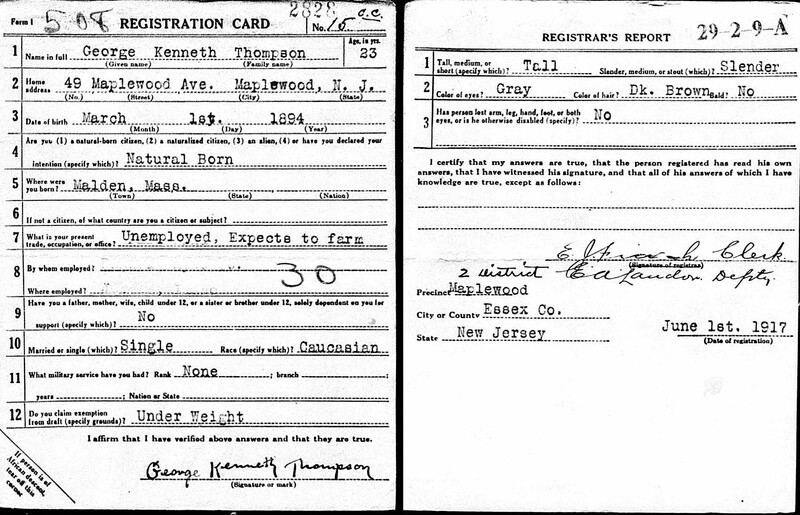 His draft card described him as tall and slender and with grey eyes. He tried to get an exception by declaring that he was “under weight”. He moved to Massachusetts at some point and married Olga Gustafson from Sweden. They had two children, Keith, who became a sailor, and Elizabeth. In 1951, they were living in Lovell, Massachusetts. 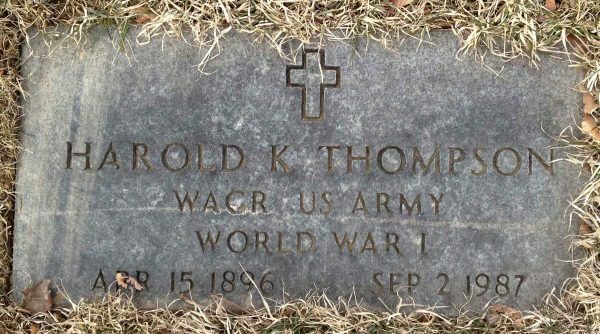 Harold Keith, like his brother, was drafted and served in World War I. Oddly enough, he too claimed that his was too “under weight” to serve. He married Caroline Smith and settled at 10 St. Lawrence Avenue in Maplewood sometime in the late 1920’s. I believe it may have been in 1926, per the Maplewood Library Real Estate Files. They lived in this house in the 30’s and 40’s. They became parents to a son and daughter, Agnes Keith (born 1923; death unknown) and Betty Page (born 1927; died May 26, 2000). Harold was a printer at Willis-McDonald & Company in Brooklyn. 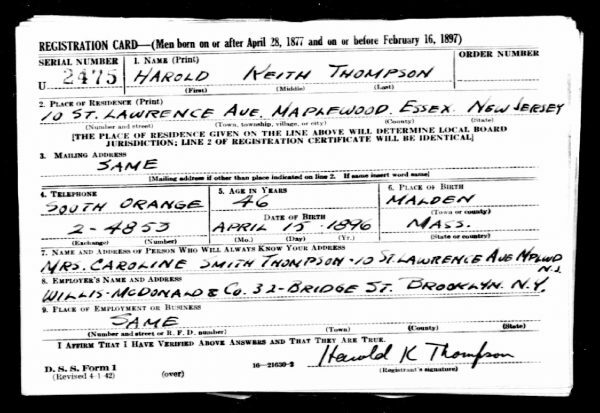 In 1942, Harold was again drafted – this time for World War II. 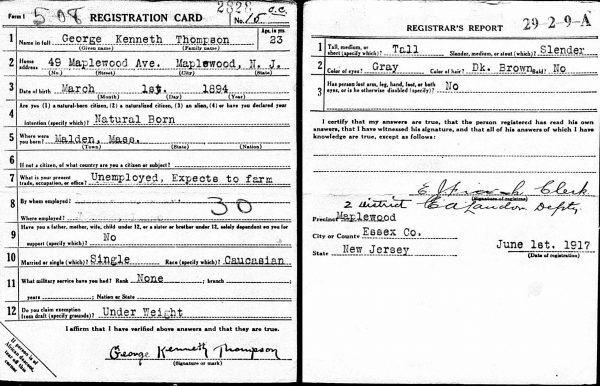 By 1951, he was living in Chatham, NJ. They gave 10 St. Lawrence to Betty. 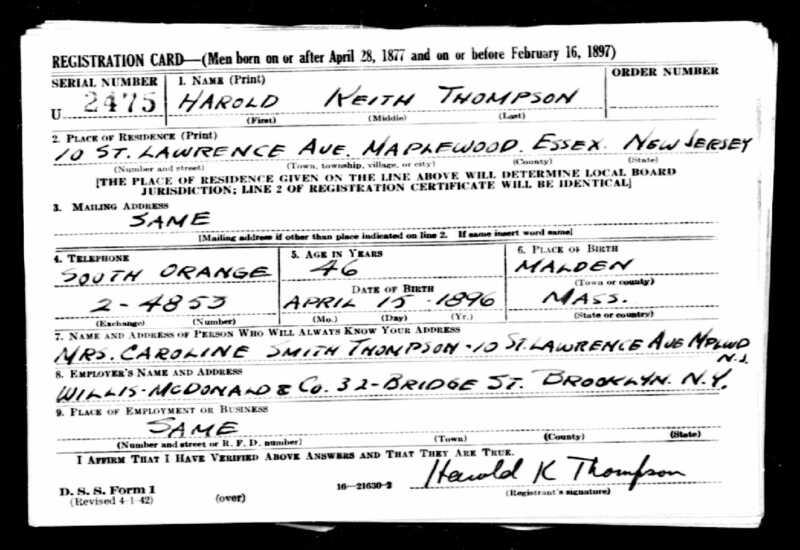 Harold died at on September 2, 1987 and is buried in a plot just a few feet from his parents and sister. In 1907, Maplewood was a small village, with some 2,000 inhabitants. According to the Thompsons, the community centered the little white chapel, now know as Morrow Memorial Church. The “sociables” in town centered around the Church, The New Year’s Teas were a highlight of the holiday season. It’s not an exaggeration to say that George Sr. was active in civic affairs. 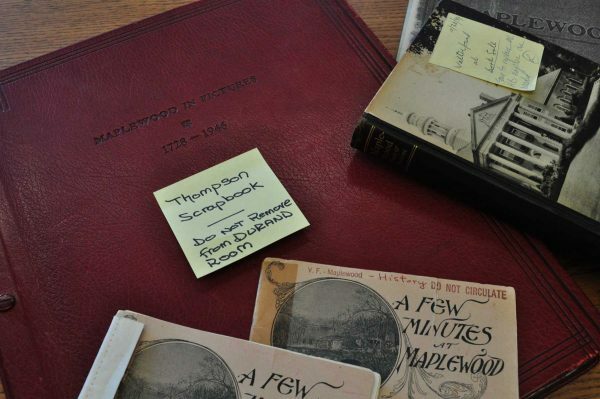 Not only did he have a deep love for Maplewood, as evident by his commitment to collecting its pictorial history, but as a member of two prominent organizations. In 1908, he joined the Maplewood Improvement Association, later known as the Civic Association. For 23 years, he was the Chairman of the Orientation and Community Christmas Tree Committee and for 28 years, he was in charge of lighting and decorating the town’s 4thof July celebrations. His participation in both resulted in the planting of over 500 curb-side samplings around Maplewood, the introduction of the first high-intensity lights in the Village, and the acquisition of land that became the current Memorial Park. 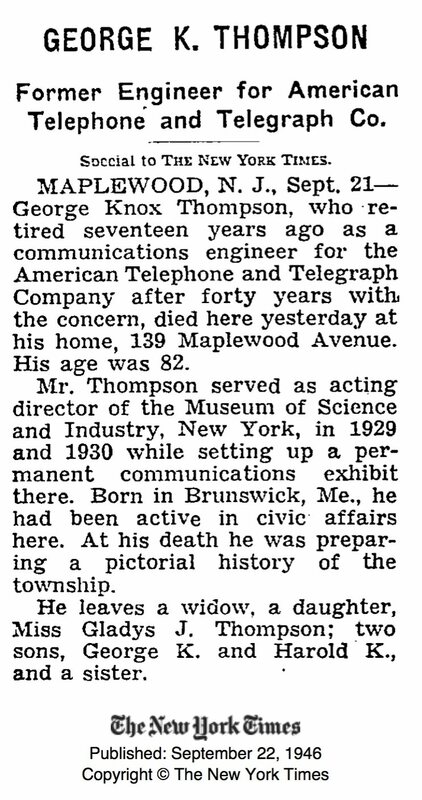 Note: To compile this brief history of my home and the Thompson Family, arguably one of Maplewood’s most prominent families of all time, I used Ancestry.com, Historic Map Works, Maplewood Memorial Library Digital Archive, specifically the Real Estate Sales Records and Photos and the News-Record of Maplewood and South Orange Archives, and The New York Times TimesMachine. 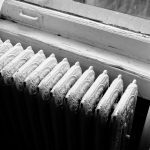 You may find more information on these resources in the Antique House Research Resources of this Blog. 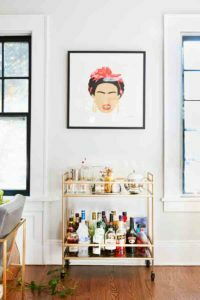 I can’t believe you were able to find out so much about your house’s original family! Makes me want to research mine. Very cool Carla! Thanks so much! 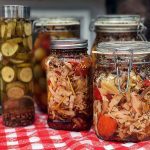 I have some info I can hare on how to research yours – happy to share it. Very cool read, Carla! Love the George and Caroline Smith! Thanks for sharing. Hello Lisa! I know right? I love it too – making connections to the past. What do you know about your gorgeous Victorian? Absolutely fascinating! George and you share so much Maplewood passion!